One Woman's Adventure Through Life and Recovery | This is my very personal story on how I'm making it through! So often the moments that impact your life forever happen so unexpectedly. On this day 17 years ago, i looked to the sky as i got ready for work and noticed how crystal clear it was. I wonder how many of those 3,000+ who never got to see the sunset that day looked up and noticed the same? I wonder how many were too busy getting through their commute to notice? We are all guilty of that too often. Millions of people who were all just like us attended to their mundane lives on a tiny island that morning. Shortly after getting their morning coffee or setting up their tasks for the day or putting off that call they’ve been dreading for just one more day, they would be evacuated. Their designated safety marshall having to pull out the procedure manual he was trained on but never really thought he’d ever have to use. Downtown shellshocked people covered in dust walking like zombies thru the unnatural clouds. Midtown and Uptown hearing rumors that NYC was under attack then looking south and seeing it was true. 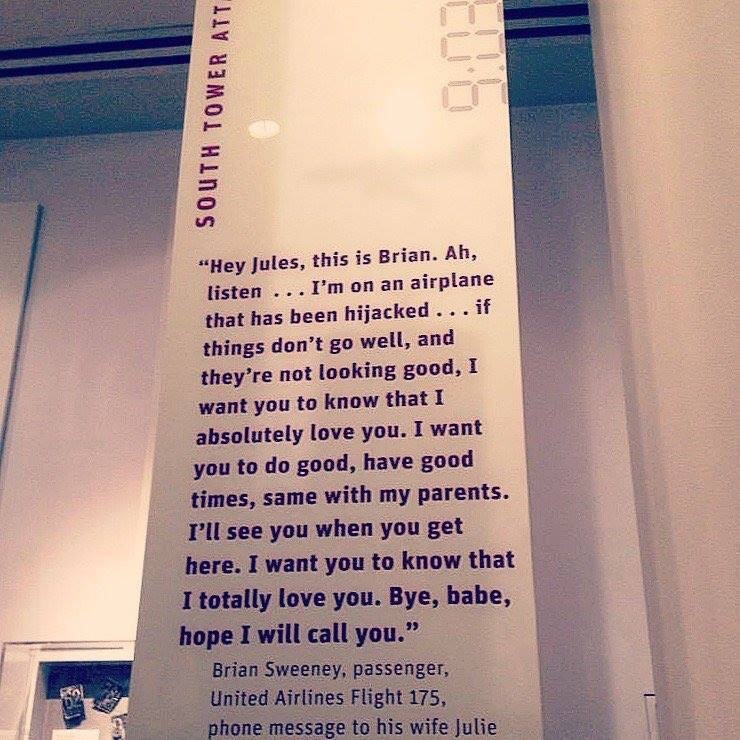 Nobody able to make a call to loved ones. Everyone trying to make their way off the tiny island that now seemed so big. Silent panic as millions of ordinary people walked across bridges. Louder panic of ordinary people in the boroughs and Long Island were terrified in the silence on their Manhattan commuting loved ones. First responders who were in the safety of home, off-duty kissed their families goodbye and headed into the unknown for weeks. After millions finally made it home on foot, the families of the still missing went downtown with homemade posters and “Have You Seen Me” flyers in the hopes that their loved ones were wandering about NYC disoriented survivors of the experience. This morning the clouds effectively hide the sun. We are each getting ready for another ordinary day in the life. But all Americans…NYers especially…are forever changed as we look to the sky. I still see the ghost of the Twin Towers as i look at our skyline. And with it, i see the souls on their ascent deep into the Universe when they abandoned their wrecked bodies there. I hope they can feel the love of we the ordinary give unto them daily and know they will never be forgotten. God bless the ordinary; we are truly extraordinary. God bless America. Today as I honor our US Veterans, I am reflecting upon how many members of my own family volunteered to serve. I am truly blessed. In the photo below is my Uncle Sidney as he graduated his training in the US Navy then onto fight in WWII. My Uncle Bob fought in Europe for the US Army during WWII. My father’s father was in the US Navy in Europe during the war then in the South Pacific during the occupation. And, of course, my Great-Grandpa Sam who served in BOTH WWI and WWII. During the Vietnam War my father and his brother served in the US Air Force and US Army respectively. I wish I had my father’s service photo. Somewhere I have a picture of my uncle in his uniform during a visit home. One day I will find it. My Aunt Cathy served with the US Army and her son, my cousin Steven, with the US Navy for what seems like forever. The blessings continue as the list of family who served in the US military goes on. There won’t be any buildings named after my relatives. No statues erected in their image. Their birthdays aren’t destined to be national holidays. But their dedication — all veterans dedication and service — to our nation makes them just as important as those who do have those things. Maybe more. When each took their oath, they knew they would not return home the same as when they left. Thankfully in my family, everyone came back with their bodies fully in tact. Yet they had all changed from the experience. And every American is better for the service of every US Veteran. How appropriate that we honor our Veterans on the 11th Day of the 11th Month in the 11th Hour, the same month as our country celebrates Thanksgiving. It is a month that gratitude is top of mind. I am in the habit of saying simply “Thank you for your service” to every Veteran I encounter. It brings a smile to their faces and makes my day every single time. I highly recommend doing this. Not only on Veterans Day but every day. Prayed to and for Mama last night. That’s nothing new. I’ve been doing that for over 15 years now. But last night the yahrzeit joined us. It made me think of the traditions Mama taught me. She was not religious but always considered herself a Jewish woman. Other members of the tribe understand this notion easily. Mama your light shines in me every day. The longer you are gone, the more I miss you. It was decided that when I was born because I was a mix of so many different cultures (among other reasons), I wouldn’t be raised in any particular religion. I would be exposed to both Catholicism and Judaism and my ultimate spiritual path would be yet another thing i was left to figure out for myself. 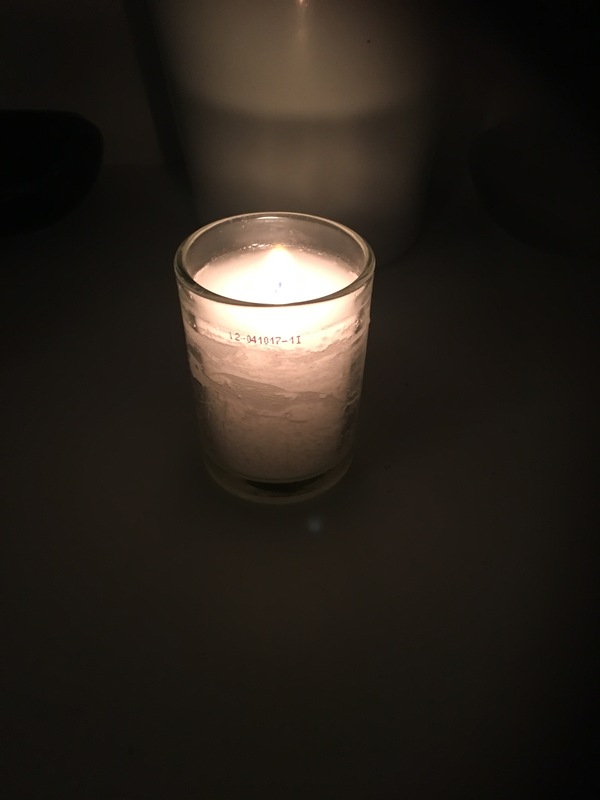 When I bought my yahrzeit candle for Mama from the supermarket, the cashier in his chit chat said, “You know, someone came in here before and bought 36 of these!” My knee jerk response was to say, “Wow…that’s a lot of dead people.” He looked back at me, puzzled, and said, “I guess you light these on a particular day?” I forget sometimes that I’m not in Queens anymore. I explained briefly that it is for Yom Kippur, the holiest day of the Jewish calendar. Candles are lit for loved ones who have passed. I felt Mama’s spirit strong in me as I spoke to this young man. It reminded me of how she explained the holidays to me years ago. He smiled and said, “Enjoy your holiday!” I didn’t correct him by telling him that Yom Kippur isn’t seen as a joyous holiday but rather a somber day of attonement. Instead I smiled back and said, “Thank you.” Not simply because my supermarket theology lesson had come to its natural end but because I have always enjoyed having a day set aside for reflection. Yom Kippur is a day for our human self to be as close to our spiritual self as a mortal can be by letting go of what our earthbound bodies require like food and water. Sin is also what makes us human. It is a day to recognize the sins we’ve committed, reconcile them with our souls and ask God for forgiveness. In years past, it is the reconciliation of my sins to my own soul that gave me the most trouble because unlike God, I lacked a clear definition of what true forgiveness is. It rendered me unable to forgive myself for the wrongs I have done and because of this, I couldn’t imagine anyone, including God Himself, being able to forgive me either. Age, experience and hard work have helped me greatly in this regard. I am ready for today. Being able to do anything for 40 years is significant. At 47, it is only now that I am grasping a true understanding of what Time does to us during our human experience and why we mark milestones. Today is the 40th anniversary of my father’s death. I am grateful to the strangers who posted the photo online of his tombstone in Arizona. When they posted this picture, the only one I have of “him,” I found out the exact date he died. I remember clearly being told the news by his mother. I remember clearly being 7 years old. I remember clearly being in Mrs. Rosenberg’s 2nd grade class, sharing the news with her and seeing the pity in her eyes. But without the kindness of these strangers, I wouldn’t have been able to mark his exit on this date for the last few years. It is as important for me to honor this date as I continue my earthly existence, hopefully for many more years, as it is for my father’s soul, wherever it may be. Hope you’ve been peaceful for the last 40 years, Dad. Maybe you can direct me to another picture of you one day…? In the last 40 years while my father’s body lay under his tombstone, I lived a life he helped to create. And when I say that, I do not simply mean in the biological sense. Even though I don’t have memories of looking into his eyes, hearing his voice or holding his hand, there are few things as significant in how I viewed myself and the importance of my life than his abandoning me as a baby then dying when I was a child. His deliberate absence to kiss the boo boos he inflicted upon me taught me a lot. Much of those things were wrong but he wasn’t there to correct me. I was a child who learned to fend for myself emotionally at an all-too-young age. As I got older, my pain hardened into anger then fermented into rage. Directed at my father. Directed at myself. Rage and self-hatred do not make a solid foundation for a life. They are fodder for bad choices. And despite my pragmatic nature, I did make bad choices. Some on an epic scale the consequences of which I am still dealing with. Thankfully rage can’t fuel an everlasting flame. As decades passed, I worked on making the corrections that my father wasn’t around to guide me through. No words of wisdom. Only his ghost that I made certain still haunted me and some degree of mental illness. It was when I became a mother that things really changed. I mean, as a parent your entire life shifts. Here I mean my relationship with myself in turn my “relationship” with my father really changed. As my baby girl and I went thru life together, achieving milestones, making mistakes, maintaining mundane everyday lives, I thought about all the things my father missed out on. As I accumulated tools in my mental health toolbox to combat my chronic depression first motivated by motherhood then carrying on for me, my heart started to break for my father. As adept he was as building and creating, his mental health toolbox was empty…and that lead to his early demise after a short life of rage, violence and self-hate. The scars are still here 40 years later. They’ll still be here in 10 more years for the next milestone of my father’s passing. They make me who I am…and 40 years later, I kinda like who I am. But to a huge extent the rage, hate and resentment that I had so long, so strong, have been replaced with love and compassion for the man who made me but never really knew. “…Tonight I want to share a little bit about…why Project 9 Line’s mission struck such a deep chord with me. 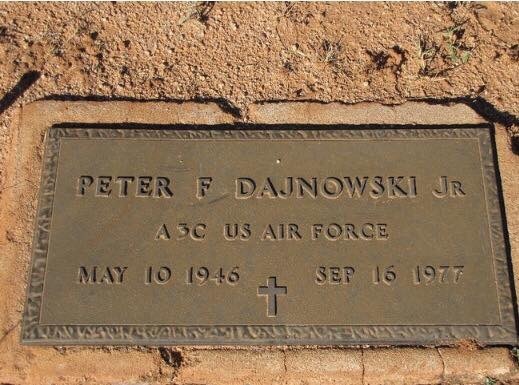 My father, Peter Frank Dajnowski, Jr.,enlisted in the US Air Force during the Vietnam War. He dreamed of one day being a pilot. While he never realized that dream, he was proud to don the uniform and serve our Nation, especially during a time of conflict. His life ended with a bullet in 1977 at age 31. It has been a long-standing controversy as to who put it there…but it has always been clear that HOW it got there was through a series of bad choices and sick thinking. That day, the war was finally over for my father. My father had mental issues and was gone from my life from the time I was an infant. All I have ever had were stories to bring him to life for me. I was told that from the time he was little, he loved to create things with his hands. He was funny. He made everyone laugh — often without trying — with his quick wit and biting sarcasm. Makes me wish I had a chance to laugh at his jokes. Fast forward to about a year ago when I met Patrick Donohue at an Islip Chamber of Commerce meeting when he told me about an organization he started. He told me that Project 9 Line works with Veterans, many of whom are combatting PTSD, helping them transition into civilian life through the arts, comedy and a variety of other ways that he will tell you more about in a moment. I couldn’t help but think of my father. Maybe if there was an organization like this back then, maybe his internal war might have ended differently. Maybe. But it’s too late to rewind that tape. It is my current hope that we can do through programs like the ones that Project 9 Line offers, that instead of a soldier’s daughter living off secondhand memories, she gets the opportunity to create her own firsthand…filled with laughter. That would be priceless. I fancy myself a writer and therefore an observer of the human condition. It’s my nature to wonder why and explore the options, often painstakingly, in my head then let those thoughts spill from my mind to written word. One of the most puzzling parts of the human experience is how we can speak so freely when expressing discontent yet remain silent on the flip side. It is said that we are all driven by one of two forces: Love and Fear. 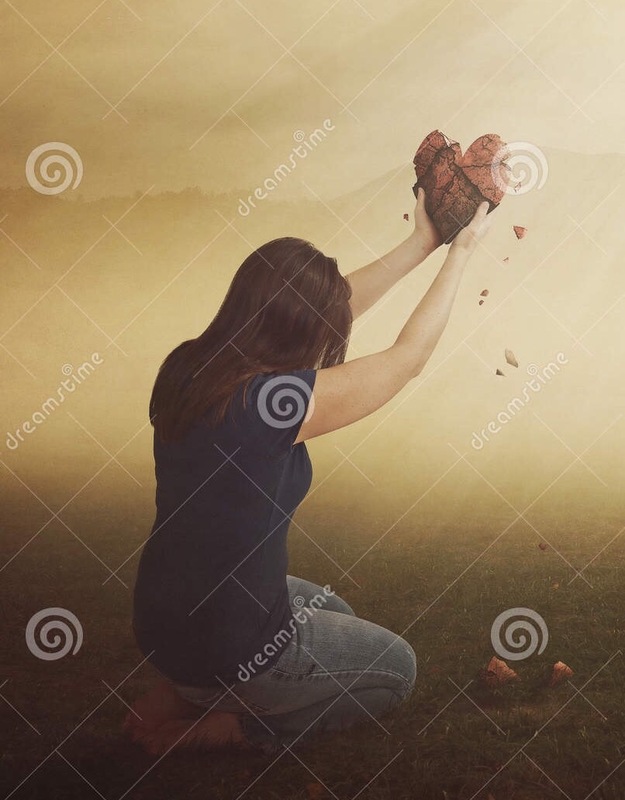 Is the comfort of Fear — lashing out wildly to strike the first blow or to encase one’s heart in cement so it won’t get hurt — that much more appealing than the vulnerability of Love? It must be. And that is life’s tragedy. So often we wait until the end is near, or even passed us by, to allow light to escape thru a crack in the wall around our truest selves. How often have I seen a friend kneel before a coffin and offer forgiveness for the long lost person who lay inside of it? How often have I seen a friend clutch the hand of another and say with a lump in their throat…I wish I told you…or I thought you knew…. How often have I been that person on my knees or the one with tears cascading down my cheeks? It is on days like this that the reminder that time runs out faster than you realize sucker punches us in the gut. So many stories of lovingly desperate last words said before their lives were stolen. Then as I was watching the relentless Hurricane Irma coverage yesterday and Hurricane Harvey the weeks before, I noticed something. The mighty and study oaks fell hard when tested by the stress of the storms that blew in and created their own destruction in addition to the storms as they came down. The tireless work of clearing their destruction will carry on long after the storm is gone. While in silent contrast, the delicate and graceful palm trees swayed and bent when they were tested by a historically fierce storm. They came out not quite the same way they went in…but they survived and they did not make the damage from the uncontrollable tempest worse. They will continue to live and grow during the recovery. And the irony of life’s full circle, the palm trees of the World Financial Center were almost all that stood 16 years ago today in their graceful defiance of the chaotic horror surrounding them. Getting older and (hopefully) wiser as I continue my keen writerly observations, I work toward operating from a place of Love more and a place of Fear less and less. It’s hard being human so I think I will try to be more like a palm tree. Being vulnerable makes you strong. Driven to my knees when i was too weak to even raise my head. It was then when i was humbled by circumstance and at my most vulnerable that i found the greatest strength. Even in solititude, we are never alone. Let God in when you feel shut out. 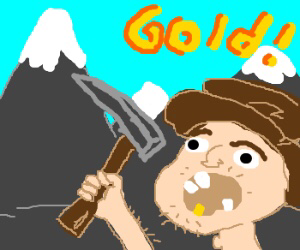 There’s GOLD in Them Thar Souls! 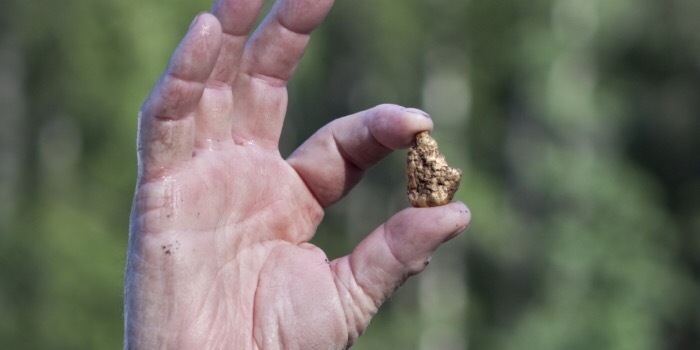 We’ve all seen the images of the Gold Rush prospectors heading into the uncharted territory of the American West based upon the rumors that “There’s GOLD in them thar hills!” It was hard, back-breaking labor but the prospectors thought it would be life-changing if they could discover these valuable, shiny bits. As I am now a middle-aged woman –goodness that’s painful to say — I find the plunders of the Gold Rush prospectors to be a lot like life. Mine anyway. Since striking out in my own at 19 into the unknown territory of adulthood based on the rumors of a better life, I’ve spent a great deal of time on and off of therapists’ couches. Each time I dipped my hile-punched tin pan into the muddy waters of my mind in the hopes of finding golden nuggets. I always did. At times there was so much muck that they were nearly impossible to see. If only relying on my eyes, I would have stopped searching. There was no shiny objects to see there. But like the Gold Rush prospectors, in my gut told me it was worth it to keep digging. It was. Now the mud is still there. In abundance. The gold is too. In less quantity for sure…but isn’t that what makes it infinitely more valuable? Dig deep in your soul. Don’t give up. 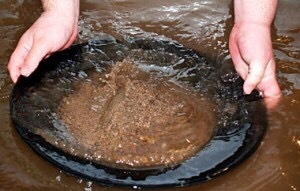 You are sure to create your own personal Gold Rush.